For intelligence to arise, living organisms are needed for it to arise in. Conditions have to be right for life, and those are dependent on astronomical and planetary factors. What those conditions are also depends on what we mean by life. Silicon- or sulfur-based life that does not use water as a solvent requires different temperatures to sustain reactions, at the very least, than does carbon- and water-based life. This discussion focuses on the conditions needed by life-as-we-know-it. Galactic centers, where the stars are very closely spaced, are unlikely environments for life because of the highly energetic ambient radiation. Energetic stars, such as blue giants, X-ray stars, pulsars, and so on, also bathe their immediate environment in hard radiation. Supernovae would wipe out any life that had formed too close to their stellar neighborhood. Solar age and temperature. Life takes time to develop. Even the fastest estimates range around a few tens of millions years. After that, a quiet stretch of time is needed for life to evolve to the point of intelligence. The shortest estimate I have seen (by an astronomer, not a biologist) is around one hundred million years. Large energetic stars last a few hundred million years and hence, under perfect conditions, might harbor sapient life. However, stars that are stable for at least a billion years, probably more, are much likelier environments for both life and intelligence. Smaller stars are cooler and longer-lived, but there are other problems associated with them (see under zone of liquid water, below). Computer simulation of the giant grazing impact on Earth that formed the moon. Instability of this magnitude melted the entire surface of the planet, but given subsequent stability, was compatible with life. 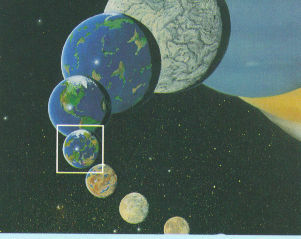 It may have even been fortuitous because there is some thought that a moon or other tide-generator may be essential to the formation of life (see below). Stability of the environment is essential to the development and evolution of life. The local star must not generate lethal stellar storms. The star has to provide relatively invariant radiation. The planet's orbit and geology needs to be reasonably stable. Relatively small perturbations can be helpful by opening up niches for other creatures. For instance, the asteroid(s) that wiped out the dinosaurs) made room for mammals. However, a perturbation big enough to melt the surface of the Earth would not be helpful. Outer orbits occupied by gas giant planets may be necessary to protect inner, terrestrial planets from asteroid impacts. By attracting, or at least fragmenting, most of the asteroids (as Jupiter did with comet Shoemaker-Levy), the gas giants increase the stability of the inner system. Chaos is now understood to be a component of solar systems. The level of orbital perturbations has to be low enough to provide stability, and--who knows--possibly high enough to stimulate bursts of evolution that keep developing life from becoming too comfortable in one groove. Well before the dinosaurs, the Permian extinction around 500 million years ago wiped out 95% of marine life (which was most life at the time) and destroyed the dominance of crinoids and brachiopods. Quite severe perturbations may foster evolution, but they are not compatible with the development of intelligence and civilization. Here again, small, stimulating disturbances may be beneficial, but anything serious enough to put everything "back to the Stone Age" would not be. It is a matter of scale. Comets are one of the perturbing factors in a solar system, but they may also be essential to the formation of life. The orbital zone around a star where water is liquid (see below) is also close enough to the star that most volatiles, such as water and oxygen, would be driven off during planetary formation. The cometary bombardment that was a feature of our early solar system returns some of these volatiles back to the inner parts of the system. Comets also carry relatively complex organic molecules, such as polycyclic aromatic hydrocarbons (PAHs) and even some amino acids that are formed by photochemistry. A planet enriched in these compounds by a cometary impact has more of the raw materials for life and hence a better chance of developing life. Zone of liquid water. Depending on the heat radiated by a star, there is a limited orbital zone within which water can be a liquid on its planets. The irony is that the cooler, longer-lived stars have narrower zones of liquid water than their hotter cousins. So, although they're likelier to provide enough time for life, they are unlikelier to have a planet that happens to be placed perfectly within a more or less narrow zone. The coolest stars will probably live as long as the universe, but present yet a further problem. Their zone of liquid water is so close to the star that a planet within it would become tidally locked. That is, the same hemisphere would always face the sun, as Mercury's does in our system or as the moon does with the Earth. A tidally locked world will have extremely uneven heating and cooling, so a temperate zone with liquid water might be found only in pockets around the day-night terminator. Whether life could develop with so few chances seems dubious. Enlargements of different types of stars, detailing the extent of the life zone around them. The binary star has no life zone shown because there are so few possible orbits in these systems that can support life. The age of a star also has a bearing on the kinds of life that could evolve there. Bacteria have a simple type of cell without internal cellular organelles, hence they also do not have sexual reproduction. (The scientific term for these types of cells is prokaryotes. Eukaryotes, on the other hand, do have internal organelles like nuclei and mitochondria. Some single celled organisms are eukaryotes. All multicellular organisms, like us, are eukaryotes.) Without sexual reproduction to shuffle genes around, bacteria have much lower levels of variability in the progeny of any given cell line. This means their whole pace of evolution is considerably slower. Given the slow pace, it would take anaerobic evolution many more hundreds of millions or even billions of years to develop to a multicellular or intelligent phase (not worrying for now about the deficiency of energy for such development to begin with). Conceivably a very cool star might last long enough, but even a star as long-lived as our sun would probably be insufficient. Orbital eccentricity Eccentricity is mainly interesting from the standpoint of the stability of the planetary environment. To take an extreme example, a planet could not sustain life if it swung from Pluto's orbit as far as Mercury's. Decreasing levels of eccentricity will eventually produce environments where life can survive. Furthermore, it's possible that wide but tolerable differences in climate could increase diversity by fostering different ecologies duirng the different periods. This is a topic that has cropped up in science fiction repeatedly. Declination. Planets rotate around their poles and if declination is too high, i. e. if one pole points too directly at the sun, part of the planet will bake continuously while the other freezes. Earth's declination of 23° means that the whole planet receives both warmth and cooling. At the poles day and night last for six months each, but at least they do both take place. On the other hand, zero declination, when the poles are perfectly perpendicular to the plane of orbit, also means that the equator receives relatively more radiation and the poles almost none. High or very low declinations would not make an unstable environment, but it would be a bad kind of stability! Gravity. There appears to be no reason why life could not evolve across a wide range of gravities. Both crushing pressure and near-weightlessness are handled with aplomb by Earth-based life. High gravity could be expected to result in stocky, multi-legged creatures with very fast reaction times. (A classic on the subject is Hal Clement's Mission of Gravity.) Low gravity organisms would likely be more delicate, possibly balance on two or even one foot, and would have the option of airborne existence. What is perhaps less obvious is that high gravity would correlate with a thicker atmosphere and higher water content. Skies would be thicker, yellower if the atmosphere is like ours, mistier or cloudier. The thicker atmospheric blanket means that high-gravity worlds in an otherwise hostile stellar neighborhood would have a better chance of harboring life than low-gravity planets. Dickinson and Schaller have two drawings (below) envisioning how all the gravity-related factors would mesh. Amount of liquid water. Life forms at interfaces between earth, air, and water, given added energy from a local star. 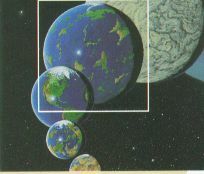 Water is a limiting factor, so the more of it a planet has, the more chance that life will take hold at least somewhere. The availability of water depends on the absolute amount, but also on the temperature of the planet, its size, and its chemistry. Water can, for instance, be bound to silicon or other minerals, in which case it is not available to living things. The planet's temperature depends on solar radiation and its position within the zone of liquid water around the star. Moon(s) and tides. Tides increase the areas over which earth, air, and water can interact, thereby increasing the zones hospitable to life. There is some thought currently that without tides it may not be possible for life to develop. 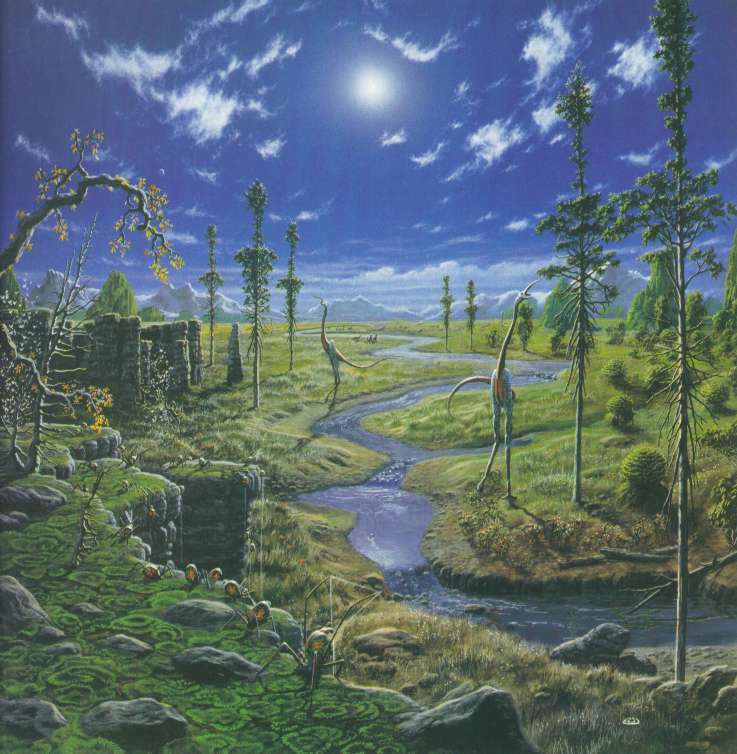 (For a popular account, see Neil Comins, What if the Moon Didn't exist?) Earth's moon is our major source of tidal movement, but any factor that generates tides might serve a similar purpose. Large moons are interesting in the completely different context of potentially harboring life themselves. They would have to be large enough to hold an atmosphere. Their parent planet could generate adequate tides. Formerly, it was thought to be unlikely that a giant planet with sufficiently large moons could be found within the zone of liquid water of its star. Recent discoveries of giants circling as close as Mercury to their stars have broadened our perspectives. On a moonless planet, how might tides be generated without postulating dangerous orbital perturbations from nearby giant planets? 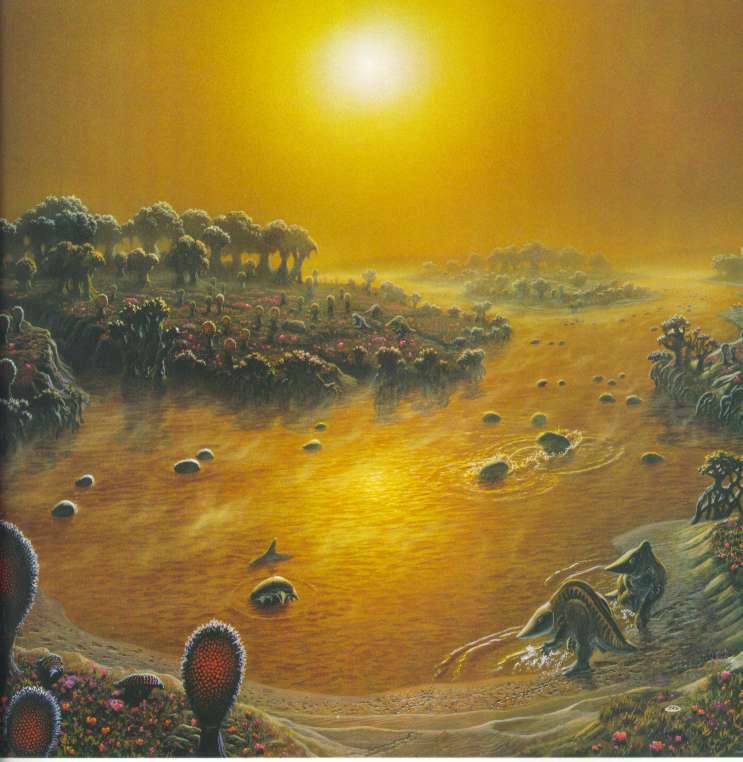 Assignment: The following two images are from Dickinson and Schaller, Extraterrestrials. List all the characteristics evident in each drawing that would be expected on a high-gravity world (left) and a low-gravity world (right). Include planetary factors (water, atmosphere, etc.) as well as biological ones (plant and animal characteristics, ecosystems occupied, etc.). Also list the likely astronomical environments of these two planets. How close to or far from their stars could they be? What is the stellar neighborhood like?